Galaxy Scientific’s President Qian Wang at the VIV Asia 2019 Conference. Galaxy Scientific’s portable high-performance QuasIR series of Fourier transform near-infrared spectrometers were exhibited at the VIV Asia 2019 Feed and Food Show, which took place on March 13th-15th in Bangkok. 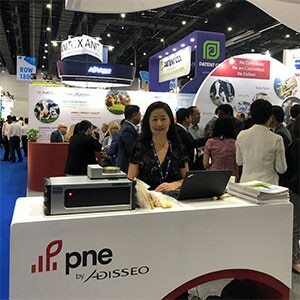 The instruments were shown by Adisseo Asia Pacific Pte Ltd.
Adisseo gave live demonstrations using a QuasIR FT-NIR spectrometer in combination with their cloud-based PNE (Precise Nutrition Evaluation) NIR database to analyze various feed ingredients for the common proximate values such as protein, moisture, fat, fiber, etc. In addition, it was demonstrated how the Galaxy Scientific spectrometer, with the Adisseo PNE database, measures digestible energies as well as key amino acids in commonly used feed ingredients. This quick cloud-based analysis provides feed producers with valuable information about the nutrients in their feed ingredients, enabling cost savings while maintaining animal nutrition performance. This entry was tagged spectrometers. Bookmark the permalink.